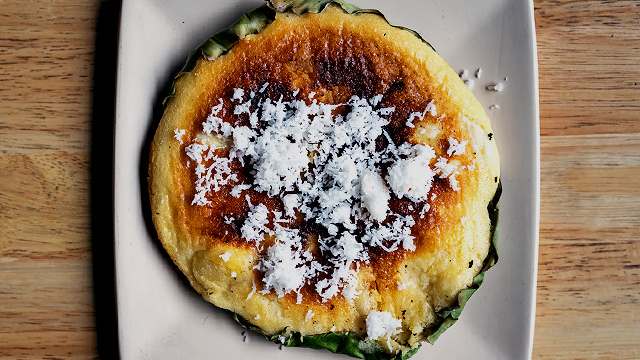 Because you're going to want to eat through what's sure to be a nail-biter. (SPOT.ph) The Eraserheads may not be reuniting at the UP-Ateneo game of UAAP Season 81 Men's Basketball, but there's still much to be excited for. A lot is at stake for both schools: For Ateneo, this could mean winning the championship for the second year in a row; for UP, it's a chance to win the Men's Basketball Title again after their championship in 1986. It's an exciting game, for sure, and we're sure whichever team you're rooting for, you're gonna be extra hungry. 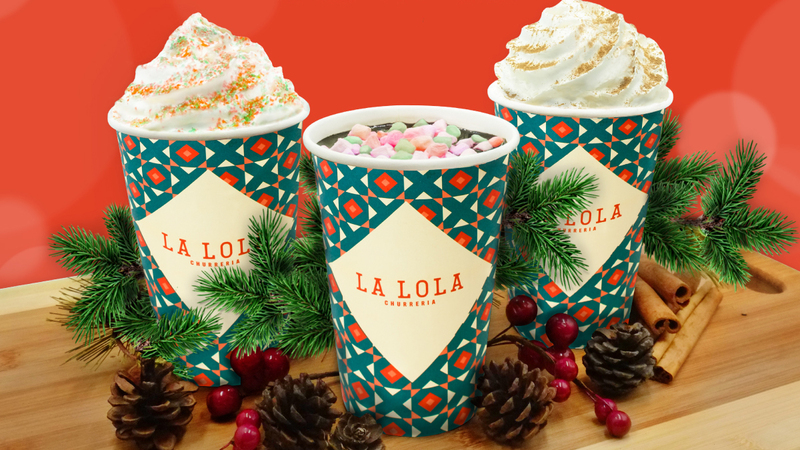 Lucky for you, a number of restaurants are hosting viewing parties—and throwing in some freebies, too. Cheering for your favorite team is sure to get you hungry—don't worry because Roku has your back. 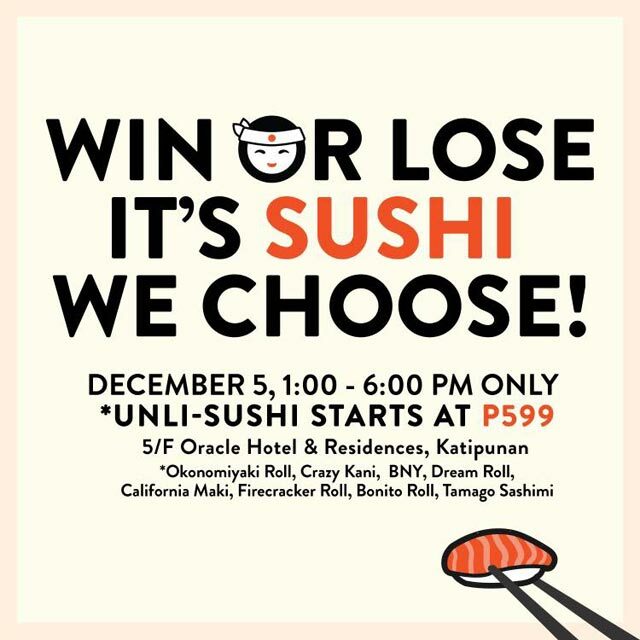 Watch the game at the Japanese restaurant and avail of their unlimited sushi promo for P599. Included in the deal are the Okonomiyaki Roll, Crazy Kani, BNY, Dream Roll, California Maki, Firecracker Roll, Bonito Roll, and Tamago Sushi. This is going from 1 p.m. to 6 p.m.
Roku is at 5/F Oracle Building, Katipunan, Quezon City. In the mood for Korean barbecue? 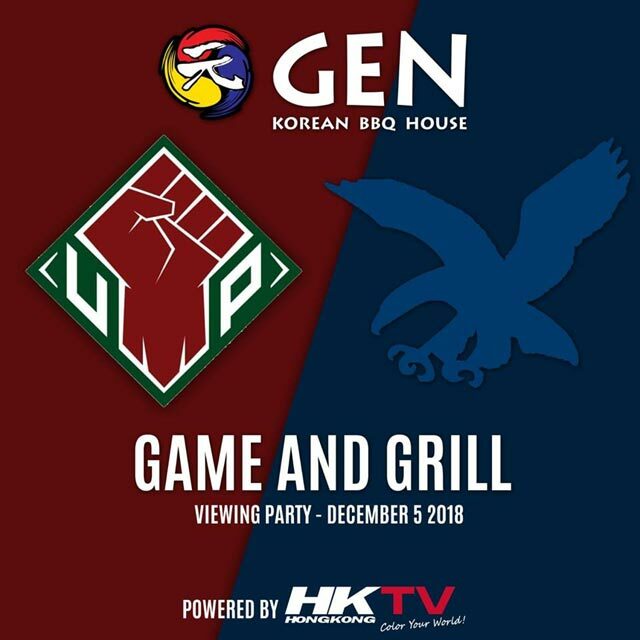 Gen Korean BBQ will be streaming the game live, so you can watch and feast on unlimited servings of over 30 kinds of meat, too. Plus, Ateneo and UP students and alumni get a cocktail carafe on the house—just present your ID. Gen Korean BBQ is at Building J, Unit 1-16, SM By the Bay, Seaside Boulevard, Mall of Asia Complex, Pasay City. Add more fun to your viewing party by cooking up okonomiyaki at Dohtonbori. Plus, the first 40 UP and Ateneo students get beer on the house. 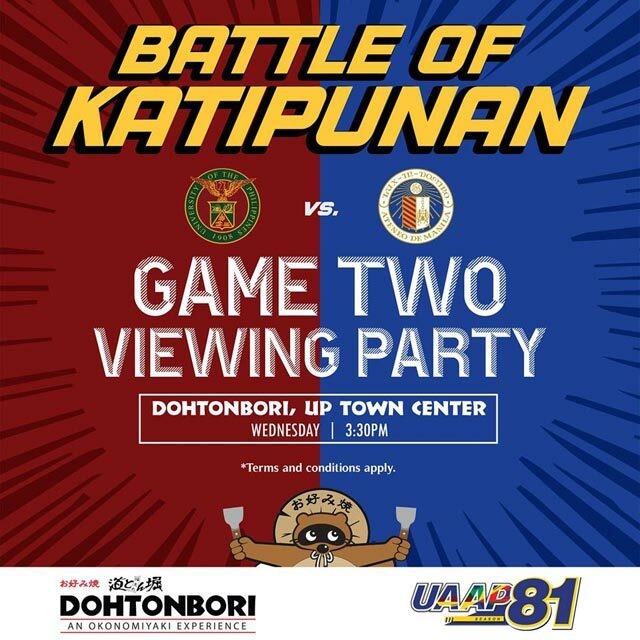 This starts at 3:30 p.m.
Dohtonbori is at 2/F UP Town Center, Katipunan Avenue, Diliman, Quezon City. 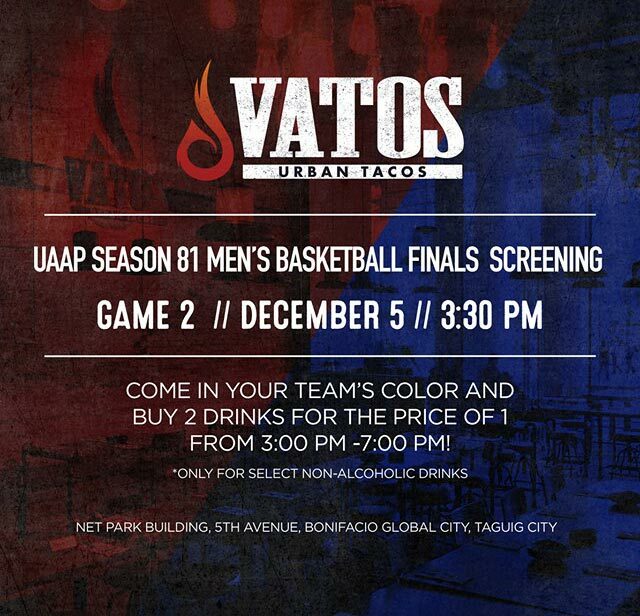 Those in BGC can catch Game 2 at Korean-Mexican restaurant Vatos Urban Tacos. Come in your chosen team's color—maroon or blue—and you can also score a buy-one-take-one deal on selected non-alcoholic drinks. Pair your drinks with their winning Kimchi Carnitas Fries! 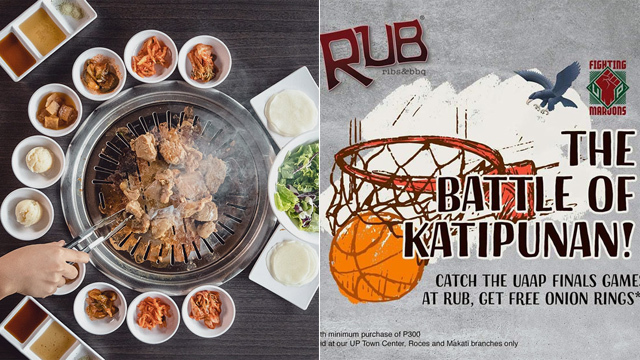 RUB is hosting a viewing party not just at their Katipunan branch but all their other branches, too! 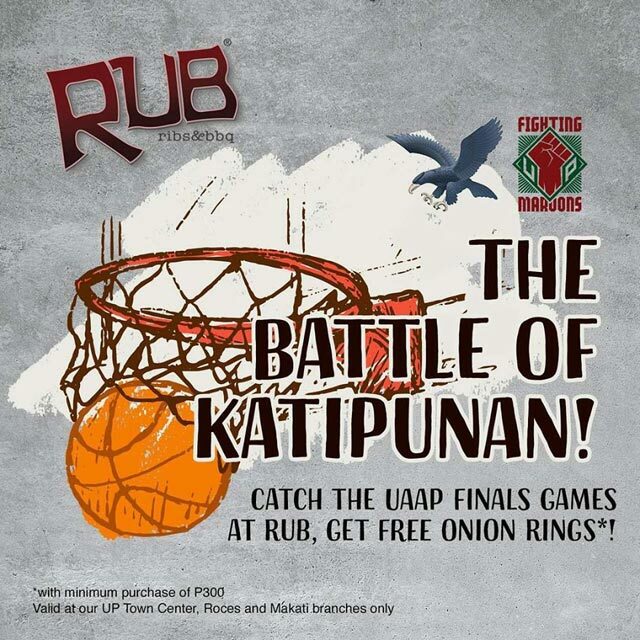 Dine at the ribs restaurant and a minimum order of P300 will get you free onion rings. See a list of RUB Ribs and Barbecue branches.